For those that are looking to improve on their beginner fishing rod, upgrading with a baitcasting reel will allow you to fish larger lures. It will provide a higher degree of control and the ability to pinpoint lure placements with extra power too. The best baitcasting reel is the Daiwa Tatula Reel, which is available with a 5:4:1, 6:3:1 or 7:3:1 gear ratio and uses 7 ball bearings plus a roller bearing. Gear ratios are significant with regards to a baitcasting reel as it describes the amount of spool turns in a single revolution of the handle. 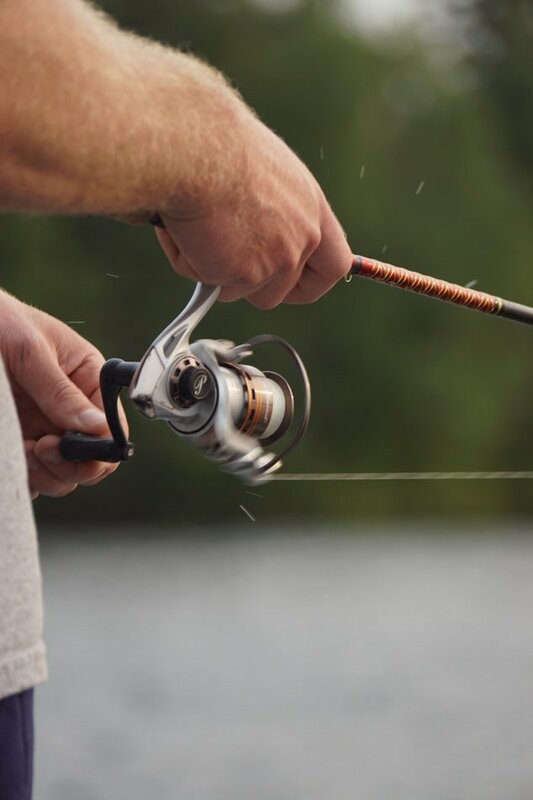 The most common gear ratio is 6:4:1 and works well for both beginners and experienced anglers. The two main benefits of using a baitcasting reel is the additional control and the improved cast accuracy. This allows you to have a better chance of catching more fish and enjoy fishing more in general. Once you have upgraded your fishing rod and reel, you will be able to catch more impressive fish. A baitcasting reel is compatible with heavier lures and lines that can handle more power and drag in the water, which is required for catching large fish. In terms of the options available, there is anything from a round to low profile design and other dedicated to certain types of fishing. Below is a list of the best baitcasting reels that provide additional control, power and accuracy when fishing. The Daiwa Tatula baitcasting reel is a very versatile reel option that is perfect for every fisher, whether you’re a beginner or experienced. The Daiwa brand makes a variety of reel options, but the Tatula is often considered their most universal option. Here are some of the notable features of the Daiwa Tatula baitcasting reel. The Daiwa Tatula reel feels very smooth while you are using it and is easy to cast. Because of its superior performance, it is often recommended for beginners who are learning to fish. It is also relatively light and comfortable to hold. Abu Garcia is another well-known fishing brand, and their BMAX3 is an option that provides great value for money. Although it is a very high quality reel, it is affordable, so it’s another option that is very good for those new to baitcasting. It is very light and efficient, so you will be able to get better performance and usage from it.. Here are some of the notable features of the Abu Garcia BMAS3 Baitcast Fishing Reel. Overall, the Abu Garcia BMAX3 baitcast reel is the best baitcasting reel for the money. The whole system is designed to be very easy to use and take some of the struggle out of fishing, particularly as you are first learning. The Ambassadeur Catfish baitcasting reel is another great option by the Abu Garcia brand. The Ambassadeur Catfish is designed specifically for larger fish, and it provides the extra power and control that you need to reign them in. The Abu Garcia Ambassadeur Catfish is a great choice for those who love baitcasting for large fish, such as catfish. This reel has tons of power that will give you the control you need to reign in these large fish while you’re out on the water. Unlike other similar alternatives, it is powerful yet still runs smoothly and is easy to use. The Piscifun Phantom Carbon baitcasting reel is designed to be one of the lightest baitcasting reels on the market. This makes it the perfect choice if you struggle with handling a heavier reel. Although it is very light, the construction is very durable and efficient, so you don’t have to worry about the reel falling apart or damaging easily. Here are some of the notable features of the Piscifun Phantom Carbon baitcasting reel. If you are looking for a lightweight baitcasting reel that doesn’t sacrifice power, the Piscifun Phantom Carbon is one of the best options on the market. The efficient design provides exceptional control, so you can focus your energy on catching fish instead of struggling with the reel. The KastKing Royale Legend is one of the best options for baitcasters looking for a cheap option that still provides quality. The KastKing Royale Legend is very affordable, but has a powerful and efficient design that is similar to some of the more expensive models on the market. Here are some of the notable features of the KastKing Royale Legend. The KastKing is a great option for any fishing enthusiasts on a budget and is the best cheap baitcasting reels you can buy. It is light and easy to carry, and it’s still strong enough to reel in big fish. You need a strong baitcasting reel to be successful when you’re fishing, particularly if you are catching very large fish. If you are new to fishing, you may not know exactly what to look for when choosing a baitcasting reel. There are many factors to look at that are indicative of the reel’s quality. Here’s what you should keep in mind when looking for a baitcasting reel. One of the first things to look at when shopping for a baitcasting reel is the gear ratio. The gear ratio indicates how many times the spool turns when you rotate the handle one time. A higher gear ratio would mean that you’re pulling in more line with one handle turn. The 6:4:1 gear ratio is usually the best all-around option for baitcasters, as it works well for many different types of fishing and different types of baits as well. The lower gear ratios are better when you are using a bait with a strong pull, because they give you a bit more time and control as you pull in. A higher gear ratio is best for anything where you would need to pull in right away, such as fishing for frogs. If you are interested in a specified type of fishing, you likely already know what gear ratio you need for that. If you aren’t sure, start with the 6:4:1 and go from there. 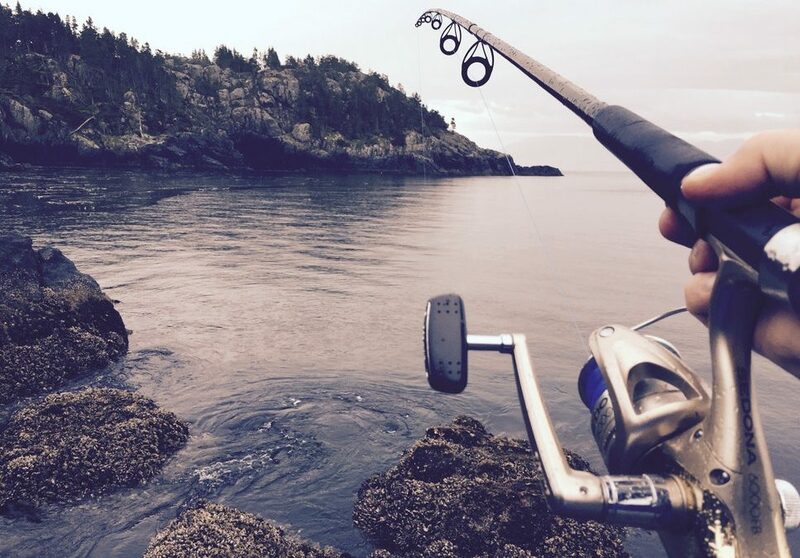 The better grip you have on the handle of your reel, the easier it will be to pull in and fish. The grip of your handle should be ergonomically designed and comfortable to hold, as you will be keeping your hand in the same position for a long period of time. Reels also come with a variety of different handle sizes, and you likely have a preference for the type of grip that you want. Larger handles are typically more effective when fishing for large fish, as one might expect. However, smaller handles are easier to control, so if you’re only fishing for small critters, then this might be a better option. Every baitcasting reel comes with ball bearings, which are balls in between the gears that help them run more smoothly. You should check before purchasing the reel to see what materials the ball bearings are made from. The ball bearings need to be smooth and very durable, because if they wear down, the gears won’t run as well. Stainless steel and ceramic are the two most popular materials for bearings, and they are both very durable and reliable bearings materials. The material of the frame of the reel is something else to take into account. The frame needs to be durable and resistant to denting and scratches, but it should also be light enough that it’s easy to hold and carry around. If the frame is too heavy, that makes it quite difficult to maneuver and can make for a challenging fishing experience. Some common frame materials to look for are graphite, aluminium, and carbon fiber. The brake system is the part of the reel that stops the line once you have cast it. A good brake system allows you to have more precision and control over exactly where the bait lands, so you can catch fish much more efficiently and effectively. There are two different types of braking systems that are used in baitcasting reels, magnetic and centrifugal. A magnetic braking system is typically more affordable than a centrifugal one, and it’s a bit easier for beginners to use. However, it isn’t as efficient as a centrifugal braking system. There should also be a tension knob on the side of the reel that controls how much tension is in the line. Ideally, you should aim to test the brake system in person if you can. However, if this isn’t an option, look for detailed information about how the brake system works online. The drag system is the mechanism of the reel that pulls the line back in after the fish has been caught. The important specification to look at here is how many pounds the drag system can pull. The stronger the drag system, the more effective it will be at pulling in very large fish. A good drag system usually can pull at least 15 pounds. Ideally, you need to be able to adjust the tension in the drag system for different types of fish. Different types of fish put varying amounts of pressure on the line, so being able to adjust the drag will make for more effective fishing. Depending on the type of fishing your are doing, you may need a specific size of spool. When shopping, you will want to ensure that you get the proper size of spool for the type of fishing that you are intending to do. For example, if you are looking for large fish or fishing in deep bodies of water, you might need a larger spool. 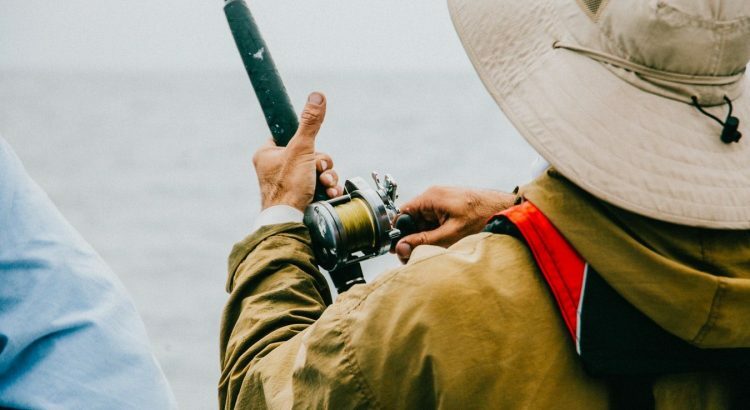 If you are unsure of what size of spool you need, you may want to consult a professional at a fishing gear specialty store to learn more about what would be best for your specific needs. This is something that is a bit harder to quantify when looking for a fishing reel, but it’s just as important. The mechanisms on your baitcasting reel should work together to create an overall experience that is simple to use. This is particularly important to look for if you are just starting to learn to fish. Many baitcasting reels that are good for beginners will market themselves as such. A good baitcasting reel is absolutely essential for anyone who loves fishing. With so many different choices on the market, it can be difficult to determine what type of reel would be best for your needs. The reels listed here in our guide are all reliable choices, and you can use our buying guide for even more guidance when making your final choice. Any baitcasting reel that you choose will have an initial learning curve, but once you master it, it’s easy and fun to use.